With the launch of a Universal Time- chronograph with a fully designed and manufactured in-house manufacture caliber proves Breitling again its watchmaking know-how. Thanks to the double disc UNITIME Transocean Chronograph displays time of all 24 time zones simultaneously and constantly on. An innovative system with a patented mechanism that allows travelers, just in a time zone change by turning the crown, all ads to be corrected and in no time. A new tool in the universe except for top-class mechanics. 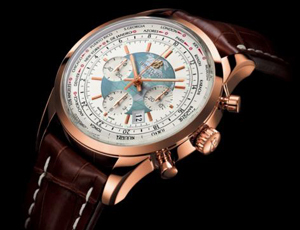 Since 1884, does Breitling in the field of chronographs and instruments for professionals Exquisite. The same applies to carriage clocks that played in the history of the brand with the winged B-Initial is also an important role. Has Breitling do not all the conquests of the sky at first hand and accompanied the rise of air transport and the long-haul flights active? In the 1950s and 1960s, the company makes of himself talking with an advanced model called UNITIME, an automatic watch with Universal Time, which was to become a highly sought-after collector’s item. Today invites Breitling back on travel and performance, and combined in a new model line Transocean – this collection reflects total sophistication and prestige luxury long-haul flights – a universal time with a chronograph . The Transocean Chronograph UNITIME combines innovative technology and style, top-class aesthetics and impresses with its modern design and factual detail through lavish care. This is shown with a globe adorned the dial. The Clock is available in steel or rose gold with a Stadtelunette in different languages. First class on the wrist. With the Calibre 01, the engineers have Breitling chronograph movement created the world’s best. The newly developed, offers the same high-performance architecture based Calibre 05 by the time universal mechanism that provides unprecedented ease of use. The Transocean UNITIME Chronograph is equipped with two mobile discs: a 24-hour disc and a disc with 24 cities in 24 time zones names. The power indicated by the central hands positioned at 12 corresponds to the time clock time zone. In addition, the indications are given regarding Stadtelunette summer time. At a time zone change it enough to pull out the crown and every hour forward or backward to rotate to correct with a single manipulation of the hour hand, the urban wheel and the 24-hour disc. The calendar automatically jumps forward or backward, to the local time date of the relevant time zone. During these operations turn Minutenund the second hand continues normally, without sacrificing precision and running time measurements are not affected.